When a hive has grown so large that it must divide its numbers to survive, one half leaves with a new queen in tow to find a new place to build a hive and call home. However, while honey bees can usually find sufficient spots out in the wild to set up shop, they sometimes end up in less than ideal places—at least for the humans around them. For a hospital in Cambridge, England, the staff discovered that fact recently after they found a swarm of about 60,000 honey bees within the hospital walls—to the point that it was said honey was “oozing” down those very walls. 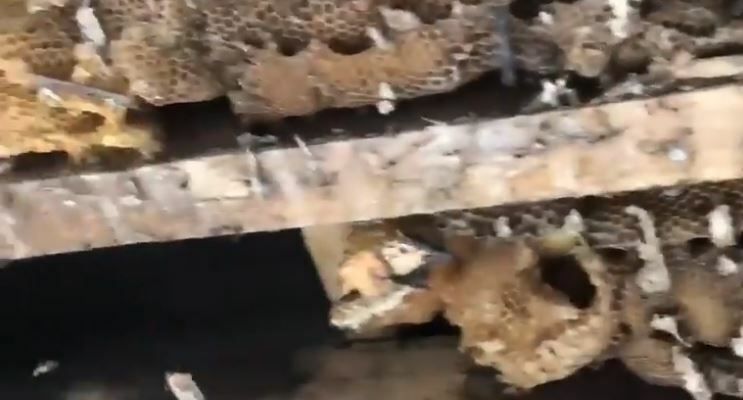 This swarm of thousands of bees was found in the hospital’s rafters after specialists answered the call of concerned hospital staff, who noticed too many bees flying around on the roof. These specialists from the local Tree Bee Society suspected the insects had been in the rafters for a while, with honey coming through the gaps in the plaster and bricks. According to local sources, the removal of the swarm, which occurred in the hospital’s Beechcroft building where most of the mental and behavioral health teams are, took approximately 12 hours to complete. Unsurprisingly, the Tree Bee specialists endured stinging from the bees while attempting to remove them. Luckily for you, you don’t have to rely on bees infesting your walls to enjoy the great taste of raw honey. If you want to try something truly special, you have to try Manuka honey. To learn more about these honey products or to get your order started, click here. And remember, we offer FREE shipping an all orders of $150 or more.